As a very young girl, Beatrice Dobiesz felt an inner desire, a gentle longing to live a life like Jesus portrayed in scripture and the gospel. She has spent many years in service to the poor and needy following the example of Jesus. As she nears her 89th birthday, she still labors in the vineyard of Jesus. She first learned to value and respect the needy from her mother. For example, when she was 8 years old, she observed her mother giving a neighbor some plants and flowers from her garden. Beatrice noticed that she gave away the nicest, largest plants. After the neighbor left, Beatrice questioned her mother, “Why did you give the prettiest plants and keep all the crooked ones?” Her wise mother answered, “When you give something to someone, you give the best.” This was a lesson that Beatrice never forgot and that guided her ministry for over 60 years. During the summer following her junior year in high school, Beatrice worked at St. Joseph’s Hospital, Chippewa Falls, Wisconsin cleaning patients' rooms. Her pay was $3.00 per week, plus room and board. During this time, she had the opportunity to observe the sisters, their life style, prayer life, and their interactions with others. She was deeply impressed. When she was 23 years old, she made the decision to join the Hospital Sisters of St. Francis. The Order’s emphasis on care of the sick and the poor attracted her. She had read and studied about the life of St. Francis of Assisi. Since St. Francis had spent his entire life helping the poor, this also resonated deep within Beatrice. She journeyed from Wisconsin to Springfield, Illinois to enter the Community. Here, Beatrice spent 2½ years in religious formation after which she professed her religious vows and assumed the name Sister Francis Regis. Sister Francis Regis attended St. John’s School of Nursing in Springfield, Illinois. At the completion of her nursing education, she attended DePaul University in Chicago for a Bachelor’s Degree followed by postgraduate studies in both medical and x-ray technology. Almost 20 years later, Sister enrolled at the University of Minnesota where she earned a Master’s Degree. Since her Master’s thesis was on Blood Bank, she later applied to the American Society of Clinical Pathologists for a Blood Bank Specialist Degree. Sister passed the required oral examination and became only the 4th person in the country with this designation. She has commented that her schooling was “too extensive” but acknowledged that this education helped her to serve God and God’s people more effectively. In her ministry, Sister Francis Regis served at St. John’s Hospital, Springfield, Illinois, St. Elizabeth’s Hospital, Belleville, Illinois, St. Vincent Hospital, Green Bay, Wisconsin, St. Mary’s Hospital, Streator, Illinois, as well as at Chippewa Valley Technical College and St. Francis Food Pantry in Eau Claire, Wisconsin. Sister relates that she has found all of her assignments fulfilling, but some are more exemplary of her desire to work with the poor. While she was working as a blood bank technician dealing with immunizations mainly in pregnancies, she occasionally found unusual antibodies. Whenever she found anything unusual, she sent a sample of blood to a noted scientist in New Jersey, Dr. Levine, a co-founder of the RH gene. One such antibody was a human Anti-M antibody. The lady who had this antibody was very poor, had six small children and a non-supporting husband. Since Dr. Levine paid $100.00 for each sample, this woman was very happy because now she could buy clothes and shoes for her children. The Pathologist at St. John’s Hospital also gave her iron samples to build up her blood. Sister was glad to be able to help the lady and noted that in 1944, $100.00 could be stretched a long way. Today, Sister Francis Regis continues her service to the needy and the poor. 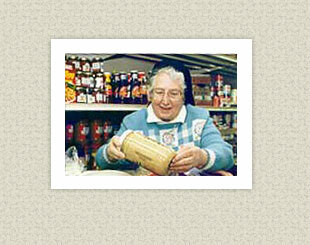 She was instrumental in the establishment of the St. Francis Food Pantry in Eau Claire, Wisconsin. Initially, when people asked for food, the Sisters gave from their convent. But when the need increased, Sister went to one of the supermarkets and asked the manager for food that could not be sold but was edible so that she could give it to the poor. He responded positively, and the St. Francis Food Pantry was born. In the year 2001, they provided 795,000 lbs. of food to almost 39,000 adults and children. At nearly 89 years young, Sister Francis Regis keeps her professional knowledge current, creates new learning opportunities for herself, and is computer literate. She is thankful to God for her health, the many opportunities she has had to serve the poor and needy, and to her superiors who in their wisdom prepared her for God’s work.